Mellington Hall Hotel01588 620056work Country House HotelMellington Hall Country House Hotel is a Grade II Listed 19th Century house set in beautiful landscaped grounds with spectacular views in every direction. Mellington Hall has 11 spacious bedrooms, all with en suite facilities. Because of the character of the building, each of them is different but all the rooms are spacious: sunny in summer, cosy in winter. Many of these can be made up with Twin beds and two of the rooms can be used as family rooms. All the rooms have spectacular views over the beautiful surrounding countryside. Dining room & function room available for conferences & weddings. Civil ceremony licence. 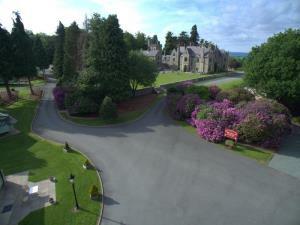 Conveniently located on the border of Mid Wales, approximately 20 miles south-west of Shrewsbury. Offas Dyke National Trail, Fishing, Pony Trekking/Riding and Shooting available nearby.